DHX The DHX elastomer is the premier elastomer for power section stators. It is a custom rubber formulation designed specifically to meet the most demanding downhole applications. It is a special high durometer / hard rubber formulation that has superior mechanical properties and bonding characteristics. The Drilex DHX stator elastomer is custom designed to achieve maximum power and torque in both water-based and oil-based applications. DHX offers maximum versatility and is capable of operating in temperature environments up to 350°F. DSR The DSR stator elastomer is a lower durometer formulation for use in less demanding applications. It is a custom formulation that features a medium hardness with good resilience for maximum life and versatility. It is suitable for use in most water-based and oil-based applications. The DSR elastomer can be operated in temperatures up to 250°F continuously with limited exposures up to 350°F. The DHX and the DSR elastomer component mixing, processing, and stator injection are precisely controlled to ensure a quality blend and uniform consistency. Both DHX and DSR elastomers are proudly manufactured in the U.S.A. under strict quality controls. Drilex offers several types of precision rotor coatings to meet a variety of downhole conditions. Each coating is specially formulated for use on multi-lobe rotors. From standard water based fluids to extreme corrosive applications, Drilex has a rotor coating that can withstand your toughest application. QPQ The Drilex standard even-thickness rotor protection is the QPQ Nitriding Process. It is an economical solution to protect rotors in light to medium duty applications. It has both corrosion and wear resistance and can be performed on an alloy steel substrate. Unlike chrome plating, the QPQ nitriding process can be easily repeated to repair worn areas without the need to strip and re-coat the rotor. CHX The Drilex CHX coating is a direct replacement for chrome. 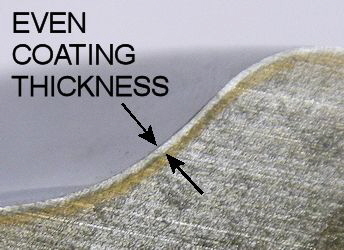 Unlike chrome, it is applied with an even thickness to minimize rotor profile distortion. This coating offers good performance and life in most types of light to medium duty applications. XR3 The Drilex Extreme Rotor Coating (XR3) is an even-thickness, tungsten carbide coating suitable for use in medium to severe applications. XR3 offers outstanding wear protection and is excellent for use in high chloride applications. Additionally, this type of coating performs very well in pneumatic applications with very little lubrication. With a coefficient of friction less than typical chrome plating, XR3 can significantly extend stator life over other types of coatings. The XR3 coating is an excellent heavy duty coating that does not require a stainless steel substrate.